In Egypt, Political Rift Deepens, Anger Grows, Protests Continue : The Two-Way Detractors of Egyptian president Mohammed Morsi breached the security perimeter of the presidential palace in Cairo. Some scrawled graffiti on its walls. 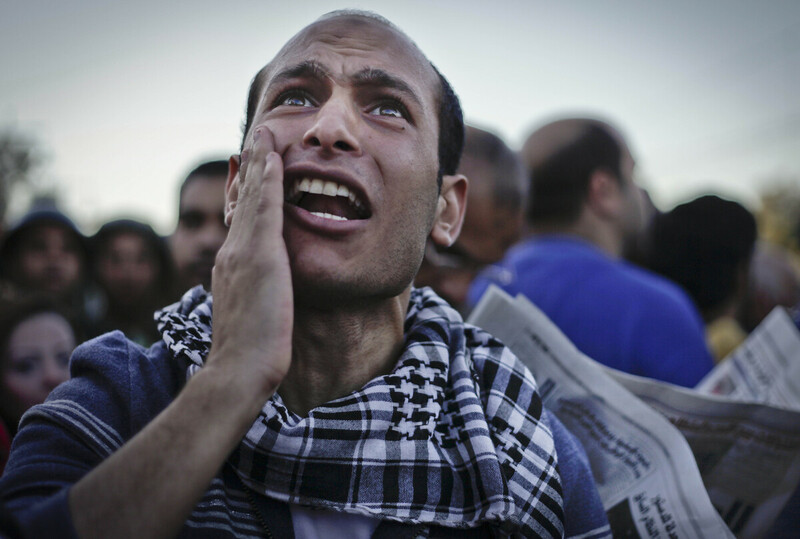 An Egyptian protester chants anti-Muslim Brotherhood slogans during a demonstration in front of the presidential palace in Cairo on Friday. Detractors of Egyptian President Mohammed Morsi breached the security perimeter of the presidential palace in Cairo today. The Associated Press' Sarah El Deeb reports via Twitter that protesters reached the palace and some of them scrawled graffiti on its walls. "Have some shame," one of the scrawls read. Entering its third week, the rift between Morsi's Islamist government and the secular and young opposition has deepened. As we reported, during a national, televised address on Thursday, Morsi asked to meet with opposition leaders on Saturday, but his call was rejected. At issue here are two things: A presidential decree that gives Morsi near-absolute power and a draft constitution that critics say is no improvement from the one the country had while Hosni Mubarak was in power. "Thousands of pro-government Islamists attended the funeral of two men killed in clashes on Wednesday outside the presidential palace, the site of continuing demonstrations by the opposition. "With blood and soul, we redeem Islam," they chanted, while calling opposition leaders "murderers" the Associated Press reported. "Simultaneously, thousands of opposition protesters streamed in separate marches toward the presidential palace, gathering there to shout "Leave!, Leave," even though Mr. Morsi does not make his residence in the building. Speakers accused the Muslim Brotherhood, which Mr. Morsi once helped lead, of sparking the violence by sending 'hired thugs' to destroy a tent camp set up by the president's opponents, the news agency reported." The Guardian gets at the big picture, here, by saying that both sides seem to be accusing each other of wanting to destroy Egypt. "Picking up on Morsi's black-and-white depiction of the clashes as 'the people' versus 'thugs,' the Muslim Brotherhood caricatures the opposition as a ragtag band of monkey-wrenchers out to undermine democracy. "There seems to be little room, in the current rhetoric from the Brotherhood or the president, for the possibility that the opposition demands are legitimate, or that the opposition voice is an Egyptian voice, one that is out for something greater or subtler than the destruction of the state." By late evening in Egypt, there was a sign that perhaps Morsi was trying to appease his opposition: The AP reports that his government announced it would delay the expatriate vote on the draft constitution, which was supposed to start tomorrow. The opposition had pointed to the vote as a reason why meeting with Morsi Saturday wouldn't accomplish anything.